We always knew George Lucas lying when he said Han Solo shot first, but now we have proof! It's hard to believe that the question of whether Han Solo (Harrison Ford) shot Greedo first ever came up at all. The scene is pretty clear when you watch the film. Han Solo gets jumped by Greedo who says, "I've been looking forward to killing you for a long time." Han Solo says, "Yes, I'll bet you have" and blasts a hole into Greedo. Pretty straightforward right? Then, the 1997 Special Edition re-release of Star Wars came out and George Lucas used special effects to make it look like Greedo shot at Han and he had to shoot back. In 2004, George Lucas' released a version that changed the timing so Han dodges Greedo's shot and then shoots back. Lucas even claimed that Greedo always shot first and fans are just confused. He told Hollywood Reporter, "The controversy over who shot first, Greedo or Han Solo, in Episode IV, what I did was try to clean up the confusion, but obviously it upset people because they wanted Solo to be a cold-blooded killer, but he actually isn’t. It had been done in all close-ups and it was confusing about who did what to whom. I put a little wider shot in there that made it clear that Greedo is the one who shot first, but everyone wanted to think that Han shot first, because they wanted to think that he actually just gunned him down." It's ridiculous. Everyone's given an opinion and even my brother and I argued for and against Han Solo shooting first. Now, CBC reports a librarian at the University of New Brunswick's library in Saint John Canada has settled the argument. 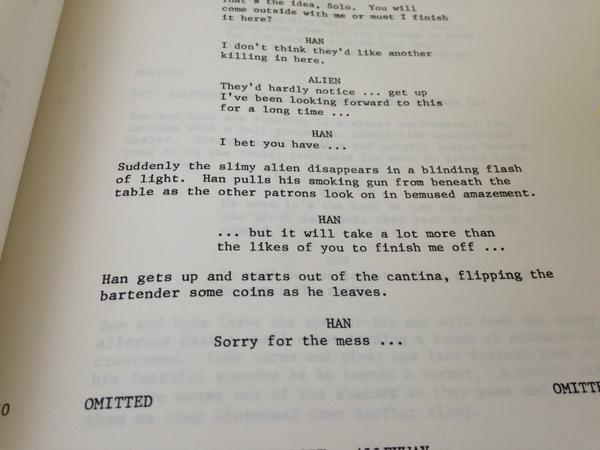 UNB Saint John librarian Kristian Brown was scanning some documents in the library's science fiction archive and found a Star Wars script dated from March 15, 1976. He said, "I was just looking actually for something else entirely and then I just found this unique looking item." 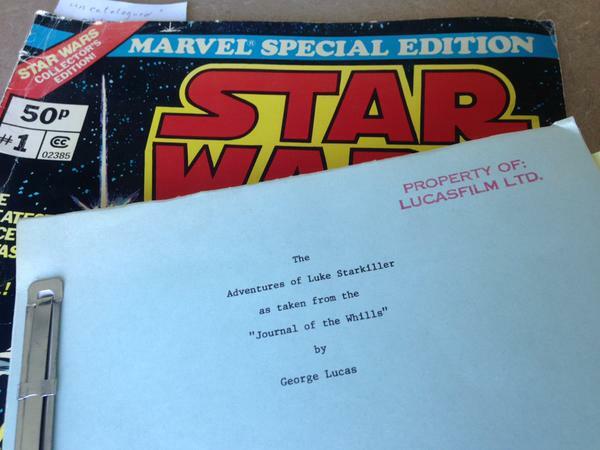 Lucasfilm Publicity said it looks authentic and is a "fan-made" replica version of the script once sold at conventions. "I’ll tell you one thing, right now. Based on the script, I can tell you 100 per cent, Han shot first." Brown added. It's nothing new and this revision of the script has been around for decades, but it just provides more physical proof. There are some differences in the fourth draft of the Star Wars script like the title "The Adventures of Luke Starkiller as Taken From the 'Journal of the Whills'" and the renaming of Luke Starkiller (Mark Hamill) to Luke Skywalker. 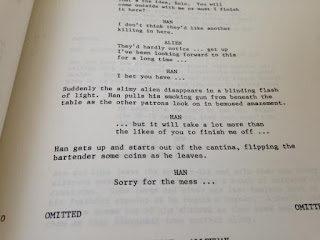 Here's how the scene plays out in the script, and notice there's no mention of Greedo shooting. Suddenly the slimey alien disappears in a blinding flash of light. Han pulls his smoking gun from beneath the table as the other patrons look on in bemused amazement. I actually like that last line and wish they'd kept it in. So, as much as we love George Lucas, his pants are firmly on fire. Do you think Han shot first? An avid science fiction fan and former professional graphic designer. After the death of my Star Wars action figures I use my powers for good and not for evil. I always thought he shot first. Lucas must've gotten soft in his old age to want to change that. Did he have a choice at that close range? I didn't even know it was a question, but in this day and age I can see why they'd try to make it look less like murder and more like self defense. Silly really, it is fiction! You got the proof David and to be tape to prove it. The smoking gun. I'm really wanting to see this movie this weekend. I remember watching the original one in the theaters and it was so awesome that I am wanting to plan my date night around this movie!!!! I have a feeling that we're gonna need to see this one several times. I'm a Jurassic Park Fan! T Rex is my fav! Because I loved Jurassic park and the lost world and can't wait to see the next evolution of this movie. I don't have a favorite dinosaur. I would love to win a ticket b/c I think this would be a great movie. I love the raptors.